Sometimes you are privileged to enter into the world of another animal, so it was for me On Valentine’s Day! 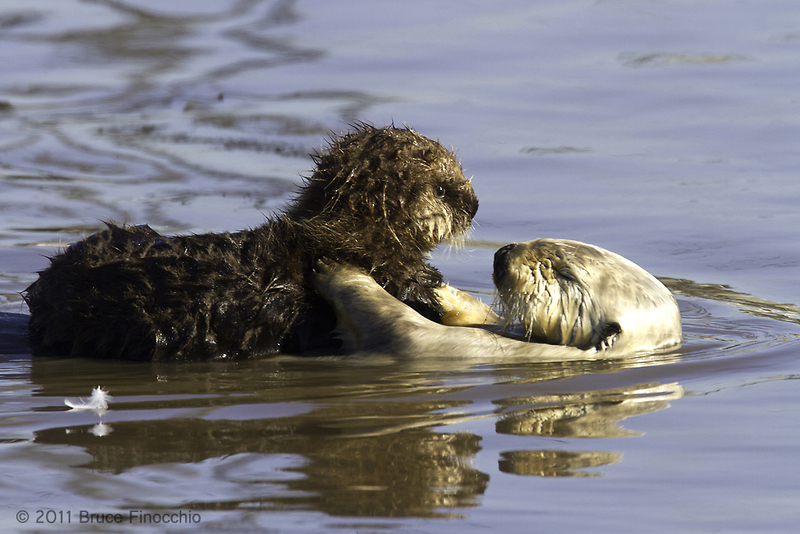 I witnessed a mother’s love, a mother sea otter’s love and deep imbibing care for her young otter pup. I saw in the wild for the first time a mother otter pushing mussels and other shellfish to her little one, perhaps for the first time…and it looked at these gifts with curious eyes full of wonder. Witnessing this moment was incredible privilege, and to capture it forever in an image was just as exciting. I hope these images convey the emotion and feeling that I felt while taking them. 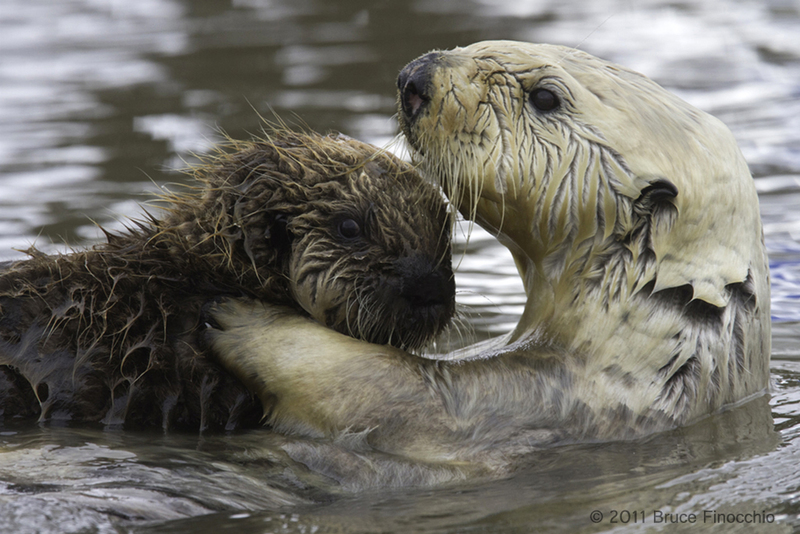 There is something special about sea otters that touches our hearts and stirs our souls… especially the young pups, you can’t look into their eyes and not be moved–their squeaky calls of alarm when they miss place their mothers, calls deep into the being of every person that has heard that sound. 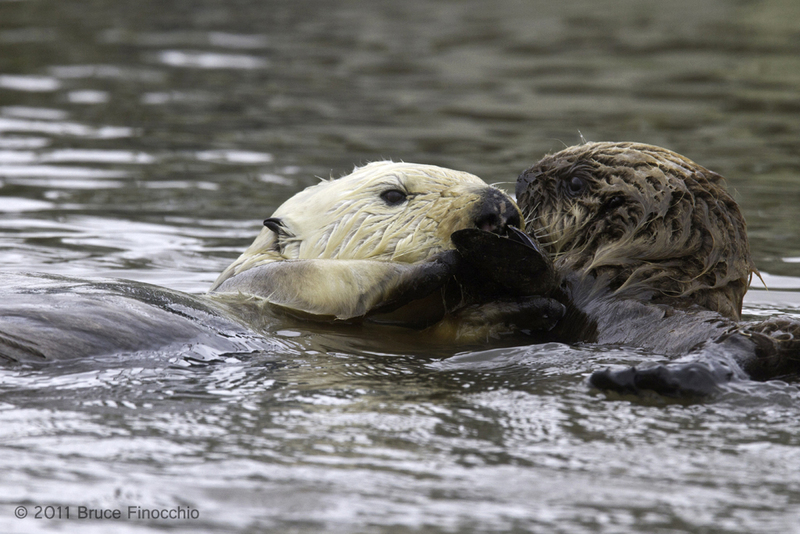 Where do you photograph sea otters? Where can you get up close and capture images that evoke these human feelings? There are many places; my favorite one is Moss Landing and Elkhorn Slough. Across from highway one and the Whole Enchilada Restaurant is a boat dock area where sometimes the otters rest and hang out. I have even seen them mating here twice. Because the land area next to the water is low and the otters aren’t far away, you can good images here. The downsides are that they aren’t always there, and good sightings can draw big crowds and attract passersby from the nearby road. Under the bluffs below Jetty Road is a very good place to see lots of otters, they usually raft up there and you can see twenty or thirty or more sometimes—quite a sight. A must stop for those who have never seen a raft of otters. The best way to photograph otters is from a kayak. You can get down at water level, and have a less condescending viewpoint in your images. 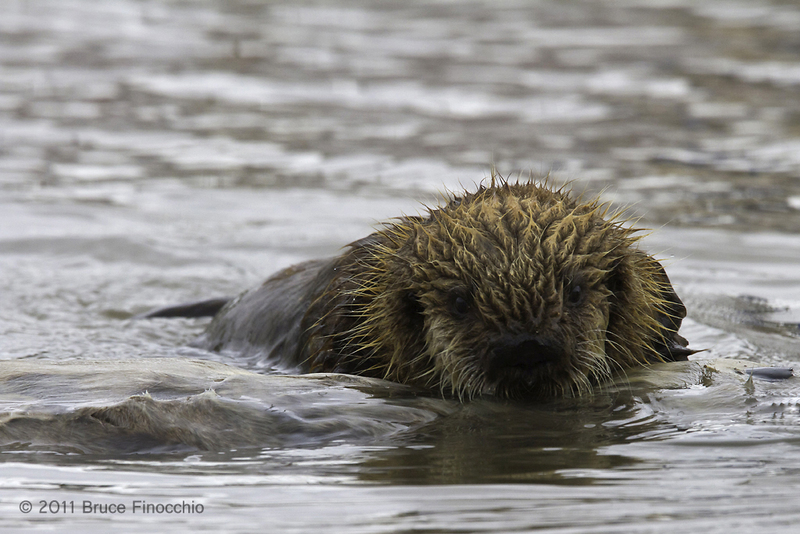 Photographing from a Kayak does present issues and dangers: choppy and rough water, stiff breezes, and a unbalanced boat, and this could result in a lens and camera body easily in Elkhorn Slough’s waters. Remember wildlife viewing rules prohibit close approach making necessary the use of long telephoto lenses. Elkhorn Safari Tours offer tours up the slough on a flat pontoon boat where you can photograph lots of wildlife and many species of birds, including sea otters that happen to be feeding close by. I think I have been on Capitan Yohn’s boat at least seven or eight times over the years. Elkhorn Slough is a beautiful and special natural place worth experiencing even without photography. *Quote from 25th Anniversary issue of Outdoor Photographer Magazine…Steve Werner, Publisher/Editor in Chief, In this Issue section, quoting George Lepp from his new book.